Funding for the MIMES Program has come to an end such that there will NOT be a MIMES Program in 2016. Should future funding be secured, this page will be updated to that effect. We are grateful to the National Science Foundation, the South Carolina Department of Natural and partnering institutions across the Fort Johnson Marine Resources Center for their support and contributions to this internship opportunity. 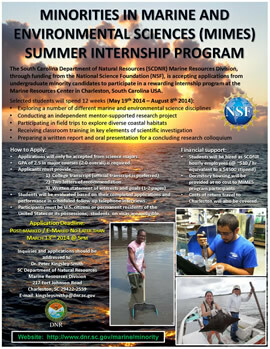 The Marine Resources Division of the South Carolina Department of Natural Resources with funding from the National Science Foundation (NSF) and the cooperation of the National Oceanic and Atmospheric Administration-NOAA) and state agencies is offering undergraduate minority science students internship positions at the Marine Resources Center on James Island (near Charleston), South Carolina. The 12-week program will be administered by staff of the Marine Resources Division (MRD) of the South Carolina Department of Natural Resources (SCDNR). Research mentors and class instructors will be drawn from MRD staff at the Marine Resources Research Institute (MRRI), as well as from the College of Charleston (CofC), Medical University of South Carolina (MUSC), Hollings Marine Laboratory (HML), Center for Coastal Ecosystem Health and Bio-molecular Research (CCEHBR) - (NOS/NOAA), and the National Institute of Standards and Technology (NIST), all situated within the Marine Resources Center in Charleston, South Carolina. Students will be offered a supportive yet challenging scientific experience: they will engage with scientific mentors to design and complete their own rigorous scientific project, take classes, participate in field work, present their work to peers, and have the chance to meet successful minority scientists. In the spring (March-April) of 2015, students will be selected to work for 12 weeks (May 18, 2015 - August 7, 2015) in Charleston, SC as paid internships, with financial support for stipends, travel, housing, and research project supplies provided by NSF. Applications will be accepted from science majors who have at least a 2.5 GPA in their major courses (2.0 overall). College transcripts and letters of recommendation from two professors are required. Applicants must provide written statements of fields of interest and goals. Students will be evaluated via scheduled telephone interviews and the information presented in their applications. Mentors experienced in various fields of marine, environmental and coastal ocean science (including chemistry, marine biology, marine policy, toxicology, microbiology, fisheries science, marine, estuarine and wetland ecology) will assist interns in completing independent research projects. Students will develop their research project, while learning scientific problem solving, writing and presentation skills. At the conclusion of the program, students will complete written reports and make oral presentations of their summer research. Participants will also receive classroom instruction on topics that will assist them with completion of their research and presentations. Offer continued mentorship beyond the scope of the 12-week summer program (e.g., by providing information regarding opportunities for minority undergraduates, offering letters of recommendation as requested, encouraging students to pursue other internships, advanced degrees, and careers in marine and environmental science fields). Funding for this REU site is provide by the National Science Foundation's Division of Ocean Science's located in Arlington, VA. The NSF contact for this program is Lisa Rom, elrom@NSF.gov or 703-292-7709. NSF does not handle REU applications; please contact each REU site directly for application information.